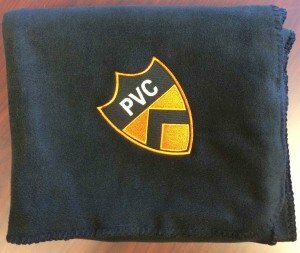 The Princeton Varsity Club is pleased to offer the opportunity for all Princeton alumni, supporters and fans to purchase the PVC fleece stadium blanket. The 50″ x 60″ blanket is made of 13 oz double-faced 100% non-pill high quality fleece. The blankets feature the PVC shield on the bottom corner and are a great way to show your Princeton pride at Tiger athletic events. Blankets are available to all Princeton Athletics supporters. There are no ordering restrictions. Non-member pricing Option #1 includes a $15 tax-deductible gift to the PVC.